Although I love the idea of Halloween and dressing in outrageous outfits, I am not usually a big fan of being scared. Maybe it goes back to my childhood when my sister would race me up the stairs at bedtime and hide somewhere in my room or the bathroom waiting for the perfect opportunity to jump out and terrify me. But this year, with the help of my courageous 11 year old, I decided to see what the fright craze was all about in NJ. 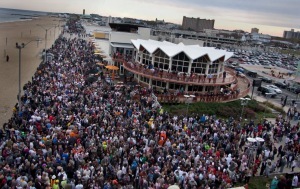 Our first visit was to Asbury Park on the evening of the Zombie Walk. 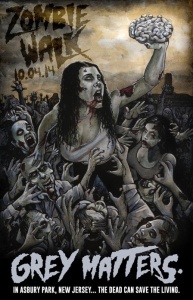 Some have called it the largest Zombie gathering in the world. from this event mostly was the unsettling feeling of what it could be like to actually live through a Zombie Apocalypse. As the sun set on the avenue at Asbury Park the zombies began to spread across the town and meander into some the stores. Bloody old women and half eaten children were standing on lines for cheese fries or a warm pretzel. The sidewalks could not hold all the zombies and they began spilling into the streets, slowly struggling to move in their tattered clothes and face prosthesis. Everywhere we looked decaying groups of people were sluggishly looking for their way home. An eerie night over all, both my little 11 year old and I decided next year we would dress as Zombie warriors and come back to join the crawl. 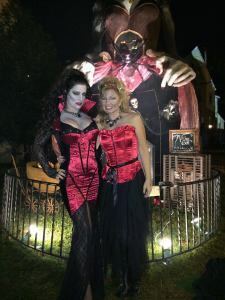 The following weekend I brought a small group of witches, cats and zombies with me to the Witches Ball in Mount Holly NJ. This event is referred to as wickedly cool and amazingly enchanted. Rather than experiencing the future omen of the apocalypse, we found ourselves propelled into the past within moments as we entered under the archway leading to the Historic Mill Race Village. As we ambled through the darkly lit streets the atmosphere of magic and mysticism enveloped us. The town had transformed into an old witches haven, with fortunetellers, artists, musicians and vendors. My mood relaxed as I meandered amongst witches and goblins, and men and women of gothic, fantasy, medieval and horror. It almost seemed as though we were all out for an eerie moonlight stroll. After listening to the great sounds of Midnight Mosaic, a local NJ band, we gathered our broomsticks and headed for our next excursion. The Casola Haunted Hay Ride in Marlboro, NJ on Rte 79 was our final stop for the evening. The many times I have taken afternoon hayrides through the cornfields could not have prepared me for the terrifying darkness that awaited us through the torch lit woods. As the rickety wagon with very little protection slowly waddled down the winding dirt road zombies, ghouls, and axe murderers threw their bodies against the sides of the wagon and clamored on board. They were moaning or screaming or laughing uncontrollably as they moved slowly through the horrified wagon looking for huddling passenger to petrify. Although my little sidekick was shaking in her boots, I felt that I could maintain my composure amongst all these horror film villains. After all, I knew that there was only one figure that could cause my skin to crawl and shatter my bravery. 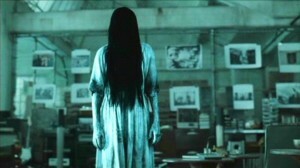 Specifically it was the little demon girl who wore the decaying antique nightgown and used her long dark stringy hair to hide her decomposing face, she was the character from the movie “The Ring”. Luckily, the ride seemed close to the end. Strangely, I sensed a quietness. As I lifted my head from the safety of my daughter’s hooded shoulders, I peeked a look around to see if the eerie villains had abandoned the ride. As I tuned to my left I spotted something white and small that seemed to be slowly flowing a few feet behind the wagon in the darkness. As I looked closer my eyes focused on the silhouette of a little girl with long hair wearing a long white night gown following the wagon in her bare feet. My heart stopped. From her pace I was sure she could never catch up to our rickety old wagon. That’s when the wagon came to a halt. I looked at my brave little 11 year old and said, “They have got to be kidding.” Sure enough the little faceless child with the bloody nightgown and dirty feet climbed a board. Not sure how she knew, but she went directly over to me and sat beside me and began to creepily hum a twisted nursery rhyme. Well…that was all she wrote! I was done and ready to go home. 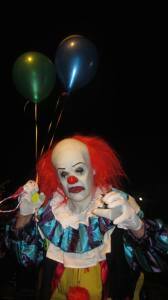 Nightmare at Gravity Hill in Jackson. 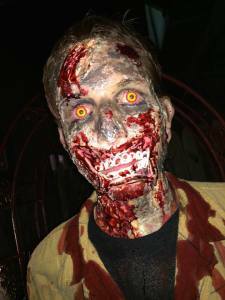 I hope you can choose a place to visit off this year’s October “To Do” list that will help you reach you scare limits this Halloween. Thanks to the creepy little faceless girl in the long bloody nightgown I will be holding off until next year, spending the next hundred sleepless nights regaining my courage. So, maybe next year I will start with a ghost tour or and haunted asylum (or maybe not). And post your favorite spine chilling Halloween experiences.